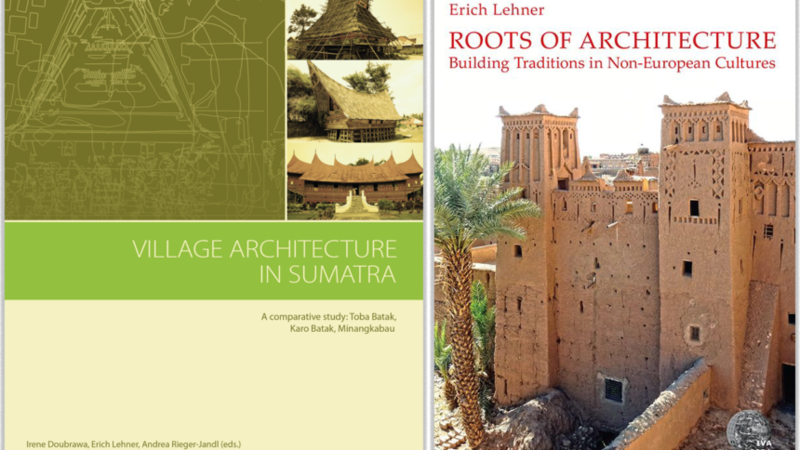 Book Presentation: "Village Architecture in Sumatra" and "Roots of Architecture"
The book presented is the result of an excursion of architecture students from TU Vienna to the island of Sumatra/Indonesia in 2014. The village architecture of Sumatra offers some of the most unique examples of built heritage in Indonesia. The distinctive roof structures with their various gables and upward-rising spires have become a symbol of the richness of Indonesian cultural heritage and the important role architecture has played in processes of identity formation throughout Indonesian history. In this volume based on comparative research of the village architecture of the Karo Batak, the Toba Batak and the Minangkabau, the distinctive characteristics of regional architectural features are examined with a view to obtain a cognitive comprehension of architectural principles. Moreover, the architecture of Sumatra is seen as a physical expression of mythological stories. An ongoing documentation and interpretation of the regional architecture can contribute to the preservation of the built heritage of Sumatra, in order to foster a sense of belonging and regional identity also for future generations. Architecture is a product of the interaction between form, function, construction and symbolism. The relationships between the various elements are independent of the size or complexity of a construction project: they are as essential for simple structures as they are for complex ones. At the same time, these basic principles, which are of fundamental importance to any architect, are not always clearly recognizable in the complex construction projects of more advanced stages of architectural development. This is where an exploration of the root forms of architecture – which fulfill the fundamental demands of construction in the most basic way – opens up new perspectives for a better and more immediate understanding of the relationship between form, construction, function and symbolism.